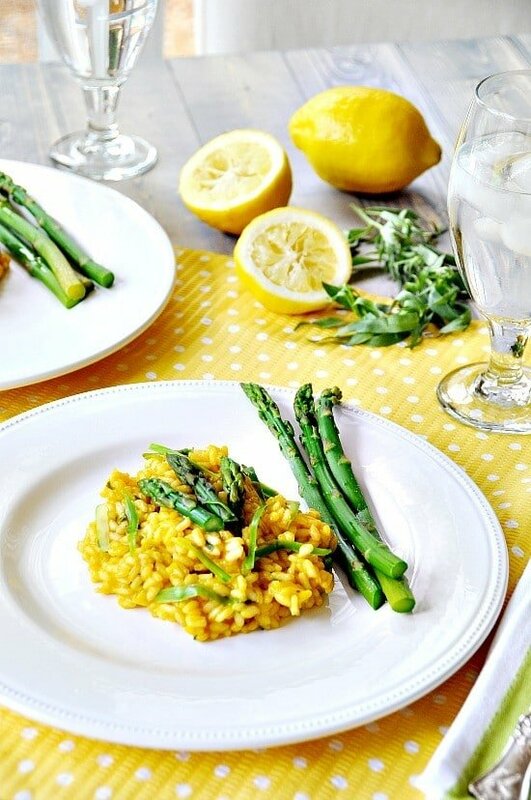 Vegan lemon and asparagus risotto is a beautiful, fresh, and bright spring recipe. Serve it as a side or make it a meal. You guys, it’s asparagus season! Are you as excited as I am? My love affair with asparagus began when I was child. Wild asparagus grew along the side of the road where I lived, and I’d go out and pick baskets of the stuff. I ate it raw, steamed, and every other way that my mom cooked it. It always broke my heart when the season ended. Today we’re fortunate enough to be able to buy it fresh at any time of the year, but nothing, absolutely nothing, tastes as wonderful as in season asparagus. Don’t ask me why, because I don’t know why, it just does. That’s why I’m going to take advantage of this time of year, and eat asparagus until I just can’t eat no more! Yesterday I made a lemon and asparagus risotto that was to die for. If you ask me, God created lemons to pair with asparagus. Seriously, is there anything more delicious that squeezing fresh lemon juice on a stalk of asparagus? I think not. 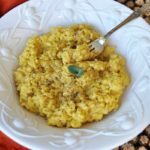 Have you ever had lemon risotto? If you have, then you know that it’s another match made in Heaven. Creamy and savory risotto with a burst of bright lemon, it’s what happiness is made of. Add some blanched asparagus to it, and we’re talking about a food utopia right there folks. Risotto is one of those things that you need to carve out time for, because it takes a while and it needs your undivided attention. But it’s so worth the effort. And, the process is actually therapeutic; cooking risotto is one of the most relaxing things that I can think of. I like to think of it as a shrink in a pan. 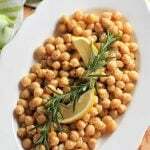 For approximately forty minutes you get to stand over a pan of thick and luscious Arborio rice and vegetable broth, while you stir continuously. What else are you going to do for that much time but think? I always work out my issues stirring risotto. I have a wooden spoon in my right hand and a glass of wine in my left, problems solved. The key to making a creamy risotto without adding cheese, is time. I cook it on low heat and add one ladle of warm vegetable broth at a time, stirring until the broth is absorbed into the rice. When all of the broth has been absorbed into the rice you can add the fresh lemon juice, tarragon, and salt. 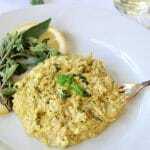 The lemon and the fresh tarragon make this typically heavy risotto feel light and spring like. 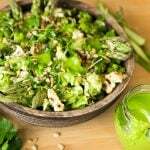 The tart lemon flavor is unexpected and it works so well with the asparagus. And, there’s just enough salt to balance the acid from the citrus. For this dish I decided to blanch the asparagus for two minutes and then put the spears in ice water so they’d be crisp, but not raw, it also made the color pop. I then cut the tips off and shaved the stalks with a vegetable peeler to make ribbons of asparagus. You can slice the stalks and eat them in large pieces if you like, but I enjoyed them shaved in this dish. Once this is done you can stir the asparagus tips into the risotto and sprinkle the ribbons on top. 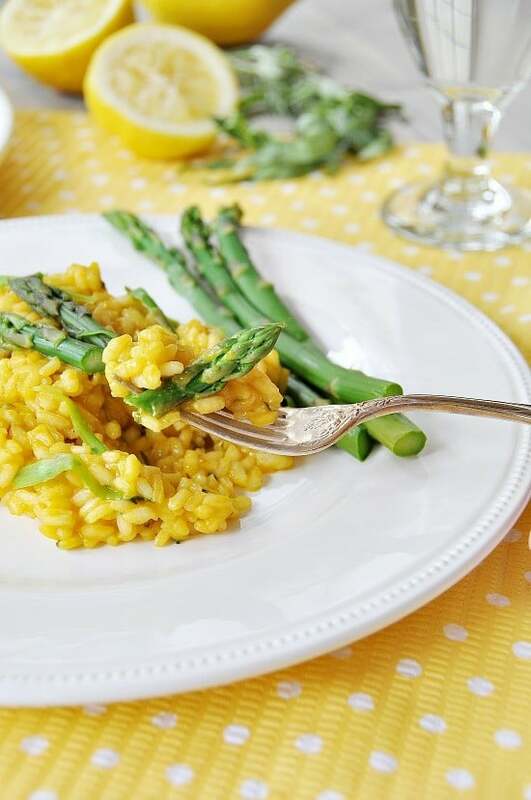 You can serve this lemon asparagus risotto as a side dish, or you can pair it with a fresh salad and make it a meal. Personally, I like it as an entrée, just because it’s an excuse to eat more of it. 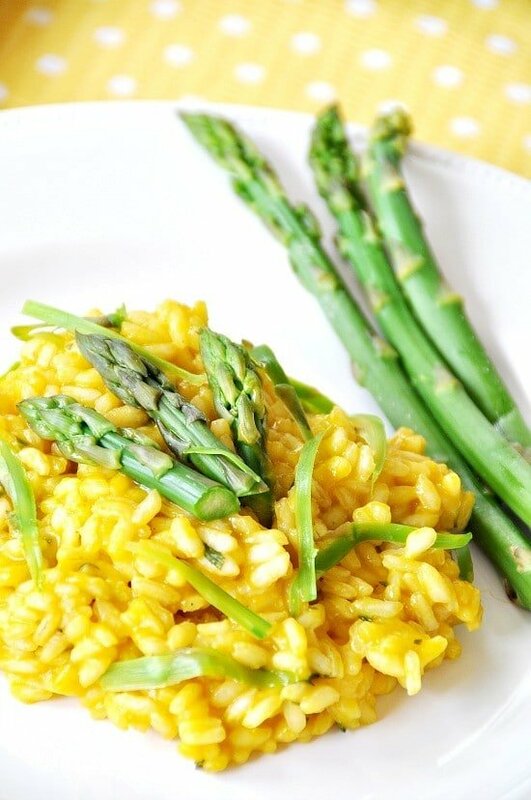 A fresh, bright, delicious spring risotto. Ground sea salt to taste. Put a few inches of water in a stock pot and bring to a boil. Add the whole asparagus and cover. Cook for two minutes then transfer to a bowl of ice water. Let sit for one minute then transfer to a plate lined with paper towels. Sprinkle with ground sea salt. 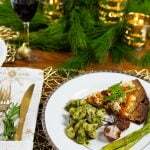 Cut the tips off and use a vegetable peeler to shave the stems into ribbons. Heat the vegetable broth in a medium sauce pan until it’s warm. In a risotto pan or a large deep pan heat the olive oil on medium heat. Add the rice and stir to coat with the oil. 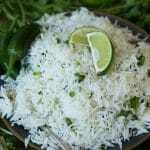 The rice should look uniformly shiny. Lower the heat to low and add one ladle (1/3 cup) of broth and stir until the broth is mostly absorbed, then add another ladle of broth. Repeat this until all of the broth has been absorbed. Stir continuously so the rice doesn’t scorch. Add the lemon juice, tarragon, and salt and stir to combine. Add the asparagus tips ( put some aside for garnish if you want) and stir to combine. 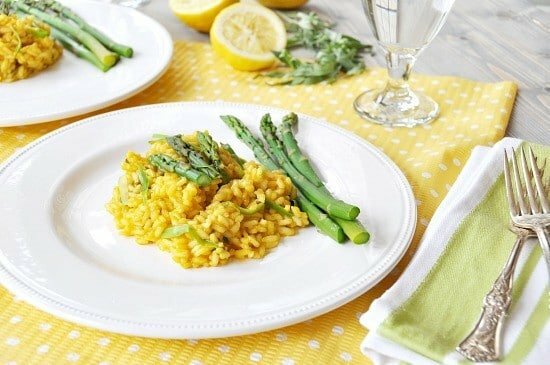 Plate the risotto and garnish with the asparagus ribbon.